Primary reason for effective camouflage: What you can't see, you can't hit! A recent symposium on body armor ended with the recommendation of attendees that more effort should be put into camouflage research, body armor should be a second priority behind finding effective camouflage "What you can't see, you can't hit!" Body armor is required when an adversary has acquired a target. Camouflage is an identifier, a uniform, it promotes a position of authority and conceals the user under the correct conditions. It needs to look professional, daunting, and most importantly - stealthy in a combat zone. If the pattern is unique then there is less chance of friendly fire accidents. If the pattern and colors blend in better then there is less likely chance of the adversary acquiring you sooner. Aren't the new Digitized patterns said to be the best? Recently the new Canadian Camouflage pattern CADPAT (Left) and the U.S. Marines pattern MARPAT (Right) based on the Canadian developed pattern, have garnered allot of attention as the pattern is made up of a digitized image using four colors. This digital effect generates a dithering effect between colors (no solid lines) and works well within 100 yards of an adversary. However, this advance in camouflage is minimal as the colors tend to blend into each at farther distances, if this blended color of the uniform is different than the background the human shape is revealed at these distances. While CADPAT and MARPAT may be the current top patterns under field tests they still have limitations which can be overcome. Prior to CADPAT, British DPM (Disruptive Pattern Material) (pictured to right) led the world in concealment competitions. Many countries have adopted DPM with different color variations. At the commissioning of a country we designed a new distinct digital camouflage for their Armed Forces which addressed the 100 yard plus problem with CADPAT and MARPAT. While this country's camouflage remains confidential, it should be noted that it will be able to compete against the best working camouflages in concealment competitions. Why would an army want to change from Olive Drab (OD) or flat colors, they test well in camouflage research? As good as the flat colors are (OD and gray), they do essentially lack the disruptive element which is crucial when there is available cover, and where ranges of engagement exceed those of built up populated areas. Canadian CADPAT is 30% more effective than Olive Drab in field testing. The CADPAT soldiers could get 30% closer than the minimum ID range for a user wearing OD. What about all the hunting camouflages that use many colors to look almost photo realistic? Camouflages used in most militaries range from 4-6 colors this is due to cost increases with printing additional colors. When making a few 100,000 uniforms each additional color adds huge costs with current printing techniques. Testing by the US Marines on hunting camouflage showed that it worked well in specific regions of similar background but only within those areas, military camouflage was better suited for wider regional applications. Why would an army want to use your design rather than off the shelf camouflage or the type it's been using for decades? Off the shelf will work but may not be as effective as a newer pattern. While one fighter jet can average over 20 million dollars, camouflage research and development for ground soldiers is one of the most under-funded and overlooked areas in the many nations militaries. Many countries in the past few years have recognized this problem and thrown millions into pattern development. How do you design any new style military camouflage with these limitations? While we don't have a large budget to fund camouflage research, advanced technology and innovation has allowed us to make a number of improvements to camouflage development, computer model testing, prototyping and production drastically reducing the turnaround time, cost and personnel involved to develop patterns which exceed concealment distances of many camouflages developed with huge multimillion dollar R&D programs. The point of camouflage is tactical effectiveness - not aesthetic appearance. Our Mutifractals (C2G patterns as we refer to it) still use 4-6 colors but are better able to confuse or trick the brain into ignoring the pattern or forcing the brain to see only certain parts of the pattern so the actual soldiers shape is not given away. The C2G patterns usually incorporate different size fractals throughout the pattern, most are graphics based on real objects found in nature, these recognizable shapes further trick the brain as the brain subconsciously ignores common patterns and colors. In some cases we have managed to develop new multifractal patterns with variable sized fractals that subtly transition in size throughout the pattern, special shading techniques actually form a subset of larger patterns from farther away helping to keep concealment at distances. These 4-6 color camouflage multifactals have been speculated within in the military research laboratories but were unattainable until now. How did you develop these multifactals? These elusive multifractals for camouflage have now been discovered and patterns have now been developed using our proprietary graphics techniques known as Camouflage Designated Enhanced Fractal Geometry (C2G). Can one pattern with one color scheme satisfy Desert, Forest and Urban regions? Another aspect that is common to current camouflage research is to find a pattern that can work in all regions temperate / tropical / desert / snow... No one color scheme can satisfy the diversity of most countries natural environmental colors. One pattern using different color schemes allows the camouflage to be a better identifier for the country that uses it. By looking at a particular pattern such as MARPAT for example, you know they are likely US Marines. A few of the C2G patterns that have been developed use fractals that are found in most global regions, such as C2G 38 Cracks; This Fractal is found around the globe in both natural and populated areas. Temperate &Tropical (Tree Branches) / Desert - (Arid ground & Salt Flats) / Urban - Cured, Aged Concrete. So this one pattern could be used around the world under different color schemes without modifying the initial pattern. You'll notice different elements of the Patterns can be pulled out and placed into another pattern such as C2G 39 D3P with Cracks which combines C2G 38 Cracks with C2G 10 D3P. Do your patterns use digital pixels similar to the Canadian and U.S. Marines new patterns? Yes as this technique allows for dithering between different parts of the pattern so there are fewer solid lines. We can make patterns with or without this pixel technique and we can vary the sizes of the pixels. Most of our current patterns incorporate both a digital micropattern matrix - pixels - difficult to see in the example pages which more or less are meant to display the larger macropattern. Micropattern matrix - or pixel digitizing is required to conceal the target when the focal (recognition) region of the eye, which is only a few degrees wide, is looking directly at the target. While the macropattern overall larger part of the pattern is designed to conceal the target from the ambient (detection) portion of the view which is about 10 times wider than the focal region of our eyesight. Field studies in the United States and Canada show that a micropattern addition to even the best macropatterns dramatically improve the concealment factor, even to larger objects as military vehicles, in this case both the macropatterns and micropatterns become larger in scale. Our patterns can not only be used for uniforms but also enlarged in scale for applications to Vehicles, Aircraft, Naval vessels and buildings. Can you duplicate an existing pattern used by another country? Only if we have permission from that country or copyright holder to do so. Can you improve our existing pattern by digitizing it? Only if we have permission from that country or copyright holder to do so. We charge $75.00 USD per hour for this design service. What if I want something particular but I can't find anything similar with your patterns? If the pattern is something original we can design it for you based on your specifications, we charge $75.00 USD per hour for this design service and we retain copyright on the pattern. How do I license on one or more of your patterns so we can evaluate the pattern in the field? An exclusive evaluation license can be obtained for 18 months maximum for $1,000 USD per month / per pattern (this includes all color variations for that pattern.) Under this exclusive license no other country can license the pattern until you stop paying for it or the 18 months has expired and you have decided against a full exclusive license. Does this cover manufacturing costs: Printing, cloth and uniform assembly? No, however, we can have samples made in quantities of 150 at reasonable prices. This is an inexpensive way (a few thousand dollars) to provide you with a good idea of what the pattern will look like on actual fabric, without incurring production run costs of 5000 yard minimums. If required, prototype fabric can be assembled into existing garment designs for field testing. Note the ink on prototypes will run if they get any moisture on them such as rain or sweat. Final production run costs vary depending on printing screen complexity, material, number of colors, size of run (5000 yard minimum), uniform style... 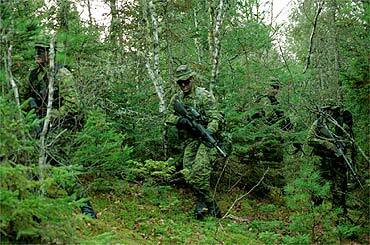 The printers are experienced in this area as they are also contracted by the US Government to produce Camouflage. Special Forces may require a limited number of uniforms (Under 5000 yards required). There are provisions for such orders but the uniforms may be a few times more expensive to manufacture, than would a uniform made from a 5000 yard run. How do I obtain a full exclusive license on one or more of your patterns so we can use the pattern? An exclusive license can be obtained for $50,000 USD per year / per pattern (this includes all color variations for that pattern.) Under this exclusive license no other country can license the pattern until you stop paying for it. There is also a 15% copyright fee charged on your cost of manufacturing each square yard of material printed. If the pattern (larger or smaller) is to be painted or applied on equipment a 15% copyright fee is charged on your cost of painting or application per item. We anticipate having to protect our patterns from copyright infringement and will pursue any group that attempts to knock off our patterns. We have acquired some of the top legal representatives in this area and will use the copyright laws within the national and international courts to protect our copyright on these designs for the license holders. Can I sublicense to another country? No, this is to stop a person, group or country from obtaining a few of our licenses and then subbing them to numerous countries, although we will consider special applications it the circumstances meet certain criteria. Do you have patterns that we can use that are not exclusive? We are considering making a few patterns nonexclusive but the 15% copyright fee would still apply and other countries may license (nonexclusively) the same pattern from us. Do you have recreational (Civilian) patterns available to license? How do I Know which Military patterns are available to license? We have listed on the pages which patterns are under exclusive License and which patterns are under reservation (exclusive evaluation license). Will you license to any country? No we will not license to a country listed on the table of Deny orders for the United States or Canada or countries subject to UN Security Council embargo. We also reserve the right to not license a country that still meets this criteria. How do I contact you if I want to discuss or license a Pattern? We will only provide patterns to Government, Military or Law Enforcement groups. We do not supply patterns beyond these groups unless the pattern can be found in our recreational digital camouflage section. What are the patterns I am seeing on the soldier on this page? We have designed over 90 patterns which you can access through the links below.